Premium Bandai announced their newest installments in the Super Mini-Pla series, Jet Icarus and Jet Garuda from Chojin Sentai Jetman. “Combine! Scram Wing! Complete! Jet Icarus!” Jet Icarus is the main mecha of the Jetman combined from Jet Hawk, Jet Condor, Jet Owl, Jet Swan, and Jet Swallow. The five Jet Machines can also form Icarus Haken. The Super Mini-Pla Jet Icarus will come with a model kit for each of the five Jet Machines and a piece of Ramune candy. “Transformation! 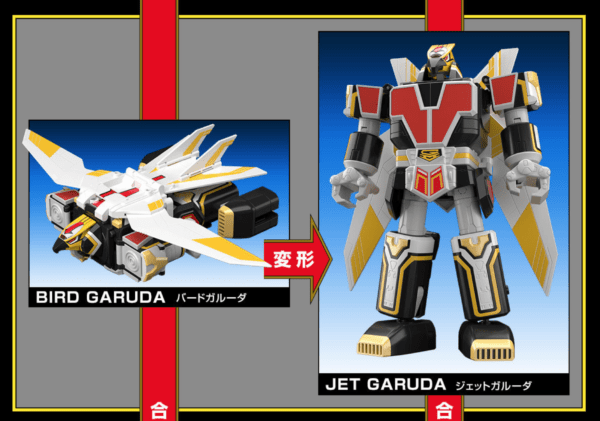 Jet Garuda” Jet Garuda is the Jetman’s second mecha that transforms from an airship called the Bird Garuda. The model can also transform into the base form, Bird Garuda. When a Jetman gives the command, the cockpit of the Bird Garuda forms the head, the tailfins become the back, the rear intakes turn into the feet, and the forward engines are the shoulders (the forearms and lower legs slide back). It forms the headdress, body (with Jet Hawk as the center), forearms, and lower legs of the Great Icarus and attaches to the rear of the Icarus Haken to form the Hyper Haken. The Super Mini Pla Jet Garuda is a PREMIUM BANDAI LIMITED and includes a model kit for Jet Garuda as well as 1 piece of Ramune candy. “Combine! Great Scram” Great Icarus is the combination of Jet Icarus and Jet Garuda and is armed with Great Beam which destroys monsters with its ultimate finishing attack, Bird Maser. Both model kits can be combined to form Hyper Haken and Great Icarus. The Super Mini-Pla Jet Icarus from Chojin Sentai Jetman will go for ¥5,400 (tax included) while the Super Mini-Pla Jet Garuda will go for ¥6,480 (tax included) and both are scheduled for shipment in June 2019. Preorders are being accepted starting today.